This sounds like an excellent collection of short stories will be adding to my TBR list, thanks for the review. You’re very welcome. Hope you enjoy! Great review! Yet another book that you make me want to rush out and buy! Thanks, Nano. It’s a nice collection for dipping into every now and again. I think you’d like them! Short stories are a recently aquired taste for me . I have several collections on my TBR for when I’m done with the Bailey’s and I’m tempted to add these too . You’ve sold it to me ! I was planning on having a s story binge ! Yay! Something to look forward to once you’ve worked your way through the Baileys list. This sounds like a stunning collection. Wonderful review, Jaqui. Are they all set in Spain or has he set some in Scotland? Thanks, Caroline – it’s a great collection of stories. Even though these stories focus on small moments in everyday life, there is something unusual about them. It’s quite difficult to explain, but I think you’d like this collection very much. Virtually all the stories appear to be set in Spain as the characters’ names and locations are Spanish. One story, ‘Nelson Street, Cul-de-Sac’, sounds as if it might have a Scottish/UK-based setting (especially as it mentions fish and chips!). I absolutely love the idea of everyday, common moments being infused with deep important meaning. This is sometimes how I think and feel so this is something that I relate to. The particular descriptions of the stories make them seem very good. I had never heard of Fraile but he sounds very good. Everyday, common moments infused with deep, important meaning – that’s it exactly, Brian. Some of these stories are charming, others are a little sad, but they illuminate the significance of those little occurrences in life. 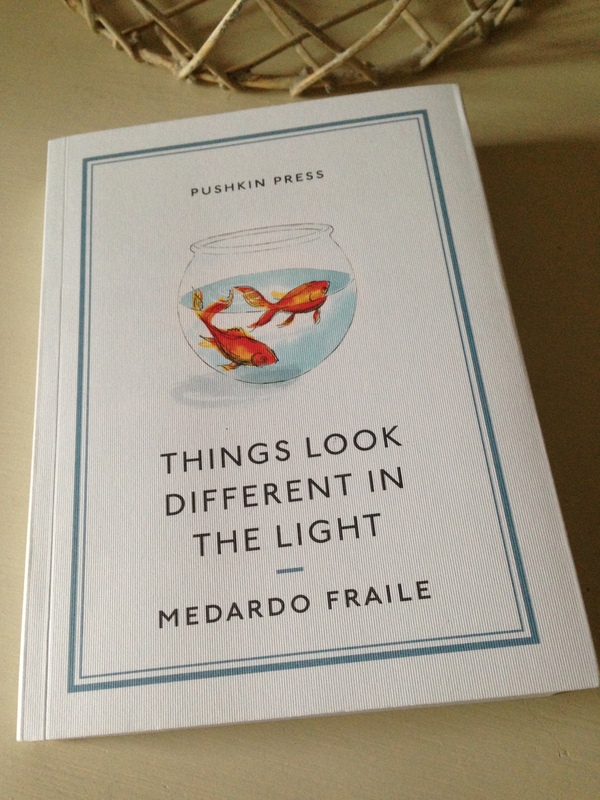 I hadn’t heard of Fraile until Pushkin Press published this collection – it’s a real find. Oh, that’s great to hear – I hope you enjoy these stories, Gemma! Even though these stories focus on small moments in everyday life, there is something ‘different’ about them. Some of Fraile’s stories have a playful edge, so I can see why Ali Smith is a fan of his work. Absolutely, Karen. Pushkin Press seem to have a knack for picking really interesting authors, and Fraile is another example of this. While I was writing this post, it occurred to me that you might like this collection – I think it’s right up your alley. It could be a good one to turn to if you find yourself in another reading slump as the stories are quite short and satisfying! It does sound rather good. Berta’s Presence particularly grabbed me. I’ll add it to a longer term TBR pile I think, as I currently have three different short story collections arguably on the go and a couple more I’ve got already earmarked, so I’ve just no space right now. They do sound good though. I often really like short stories, these sound excellent. If you enjoy short stories, then Fraile is definitely worth a look. Such a lovely little book, so deceptive in its “lightness” (I feel like an idiot for having not picked up on the repeated uses of light in the stories – so obvious once pointed out!). Glad you liked this. It’s remarkable how your mere mention of these stories brings them rushing right back. Hey, don’t be too hard on yourself! I loved your comments on Fraile’s lightness of touch and sense of wonder at the marvellous strangeness of the world around us! I can’t remember when I last enjoyed a collection as much as this one. Such simple ideas, beautifully executed (the story about repeated cases of mistaken identity was another favourite). A collection to revisit at some point. Marvellous (yes, you’ve got more enough on your plate with the IFFP!). It’s a delightful collection. Even though these stories focus on small moments in life, there is something utterly beguiling about them. Well done on your great progress with your TBR20 challenge Jacqui. Not an author I’ve heard of and I admit I’ve read little Spanish literature in translation, only Zafon springs to mind. Thanks, Lindsay. I’m actually reading book 19 at the moment with several reviews still to be written! Once I’ve finished this round of #TBR20, I might take a short break to buy 5 or 6 books and then do it again. I hadn’t heard of Fraile before Pushkin published this collection, the first translation of his work into English. He’s probably not very well known over here, but I hope this collection will help. I ended up reading (and buying!) a whole bunch of Spanish books in July for Stu and Richard’s Spanish Lit Month. I’m hoping they’ll do it again this year. I read Zafon’s Shadow of the Wind with an old book group, but it was so long ago that I can’t remember much about it. If you’re ever thinking of trying some more Spanish lit, you might want to take a look at Nada by Carmen Laforet (a novel I reviewed last year). I think you’d like it very much. Belated thanks for the link. I loved this collection (and not just because he settled in Scotland!) Also another reason to love Ali Smith, who provides a great introduction. You’re very welcome, Grant. I picked this up off the back of your review for Spanish Lit Month and Scott’s post too. Yes, Ali Smith’s intro was a bonus (and I’m hoping it might encourage others to try Fraile’s stories! ).